SEATTLE — SMART Transportation Division President John Previsich answered questions from members about the Janus decision, upcoming 2019 national rail labor contract negotiations and discussed new technological initiatives. Transportation Division President John Previsich addresses the closing session of the SMART TD Regional Meeting in Seattle on July 4. The Janus decision affects a handful of properties that have SMART TD representation, but leaves rail properties relatively unscathed for the time being, Previsich said. Potentially one rail property and some bus properties could be affected by Janus, he said. It’s those future attacks from anti-labor interests and court cases that we’ll have to be aware of in this era where all branches of government are stacked against labor, he said. To fight back, union brothers and sisters, their friends, neighbors, families and others will need to vote and get the word out on issues important to the union, such as safety. Also regarding politics, a member asked about how the viewpoints of members who are more conservative would be addressed. Some members may have strong feelings on conservative issues, but those issues need to be balanced with the impact it will have on their livelihood and their families, he said. Also ahead, is the start of negotiations for a new national rail contract, which is up in 2019, with a number of details to be determined. Previsich said that the joint negotiating tactics by unions that were successful in the last contract will be repeated at least at the outset of the new talks as the carriers offer up their resistance. The labor side is well aware of the breaks the carriers got with the Republican tax plan that was passed in late 2018, and that will definitely be in play during contract talks, Previsich said. A Section 6 filing to signal the start of negotiation will be filed in the future, he said. 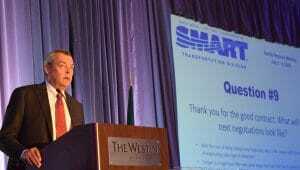 SMART TD also is improving its technological base, Previsich said. “One of the things we are trying to do is leverage the technology in a way that is going to improve communications that we have,” Previsich said. Questions were submitted by members using the upgraded and improved SMART TD app. It can be downloaded from the Apple App Store or through Google or by visiting www.smart-union.org/td/mobile. Also ahead are upgrades from the decades-old legacy system to help improve how local secretaries and treasurers do their jobs with a rollout planned to begin in October with full implementation in January 2019.